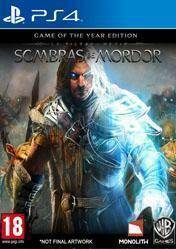 This version is a physical edition of the game Middle Earth: Shadows of Mordor Game of the Year Edition, or "GOTY" for PS4 (Playstation 4). Middle Earth: Shadows of Mordor is a stealth action game that was released in early 2014 and was pleasantly surprised everyone with its technical level, playability and fun. Now, winner of numerous awards, it comes loaded with extras. Middle Earth: Shadows of Mordor Goty includes the original game of Middle Earth: Shadows of Mordor over its two expansions or DLC, 'The Lord of the Hunt "and" The Lord of Light' to increase the number of missions available in addition to also include new skins for your character, new runes to our weapons and missions. We will embody the role of a watcher Ranger, Talion, and one fateful night a band of Orcs decide to kill our entire family. We will be killed too, but reborn with a power that will help us to avenge our family. The ability to mentally control our enemies, using a lethal spiritual bow, and perform combos and incredible skills will be just some of the advantages of this new power. There are no comments yet about Middle earth Shadow of Mordor GOTY. You can be the first one!